Our certified translators (sworn translators) hold language degrees and are members of the Association of Scientific and Technical Translators in Belgrade, Serbia. A certified translator is a language professional with the highest level of linguistic training authorized to certify with his/her signature and seal that the translated document is fully true to the original text. A certified translator is a sworn translator called upon by the court for judicial cases to provide translation and interpretation services. They must demonstate an exceptional understanding of Serbian and another language. In addition, they must have a strong grasp of legal terminology and the legal process. Our certified translators are experienced experts in translating various texts. In Serbia, a sworn translator appointed by the Ministry of Justice is the only type of translator with a universally recognized competence in translation. All of our certified translators have passed a certification exam and sworn an oath before the Ministry of Justice. While working most often on legal translations, a certified translator is by no means professionally restricted to court service; he/she is also a professional translator providing translations which do not require certification. 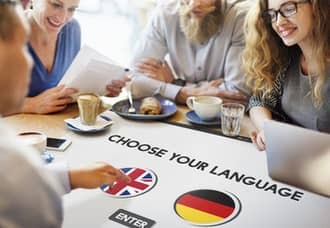 In addition to the English language, our translation company provides both certified and standard translation services for German, French, Italian and Spanish documents. You are also welcome to contact us for translation services in almost any language, in which case we will contact our trustworthy associates.